This soccer field guide will give you the right dimensions for youth soccer fields. Here is a table of how big youth soccer fields should be. These soccer field dimensions are the official ones from the US Youth Soccer Association. Having coached soccer the 2-5 year old age groups for quite a few years, I'd like to add recommended dimensions for soccer field sizes for preschool age children and toddlers. The most important factor in determining the size of the soccer field for these youngest of soccer players depends on the number of players you are coaching. You have plenty of flexibility when you're setting up a soccer field for 2, 3, and 4 year old soccer players. As mentioned above, you should figure the best size for your field based on the number of kids that will be playing. You don't need painted white lines in order for the kids to have a blast and learn about the game of soccer. Use colored disks to set up small fields and you can easily adjust them in a few seconds once you observe how the size is working. In general larger fields give the kids more freedom to run and this will help them develop their fitness. Smaller fields will give them more social interaction with their teammates and will provide more opportunities for "touches" on the soccer ball. Four year olds are more interested in running to the ball, no matter where it is on the field, so an expanded size of the soccer field is fine. This is the age when scrimmages and actual soccer games can be played with teams. If the dimensions of the field are too small, too much time is wasted with balls leaving the field of play, and you should. Three years olds are beginning to understand the concept of a restricted area where the games are played. Although painted lines are nice, you'll make out fine by using different colored cones to designate different areas. Three year olds lose enthusiasm to participate real fast if they become too winded from running a filed that is too big in size. The preferred size of this age group is 6 players on the field, or 3 v 3. Two year olds don't yet understand the concept of sidelines or being "out of bounds." 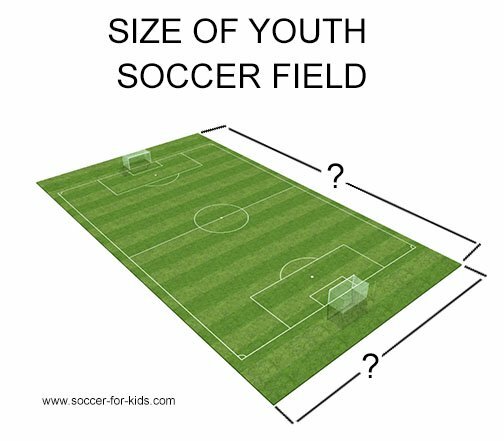 Here is the USA, we're accustomed to understanding soccer field dimensions expressed in feet, rather than yards or meters, so here are the dimensions of youth soccer fields in feet. The size of the soccer practice field has a big impact on both how successful your practice session goes, as well as how much fun the kids have. 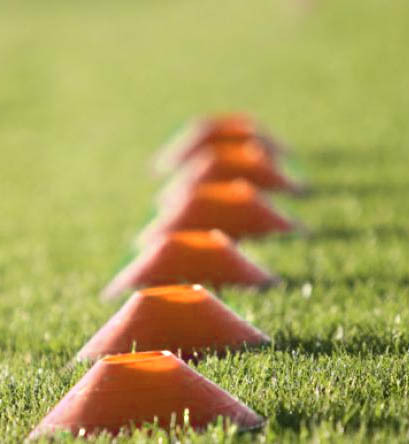 I've found that most of the recommended practice size fields that I've seen published don't take into account the specific game or drill you're running. As you introduce a new game or drill into a practice, enlarge or diminish the size of the field based on what is happening. This observation skill develops as you get more experience in running practices for different levels and ages of kids. You can set ups smaller sized practice soccer fields within the boundaries of the larger game fields. Smaller fields will give the kids more touches. Larger fields give the kids more space to run in and make it easier for them to succeed at certain games like keepaway. 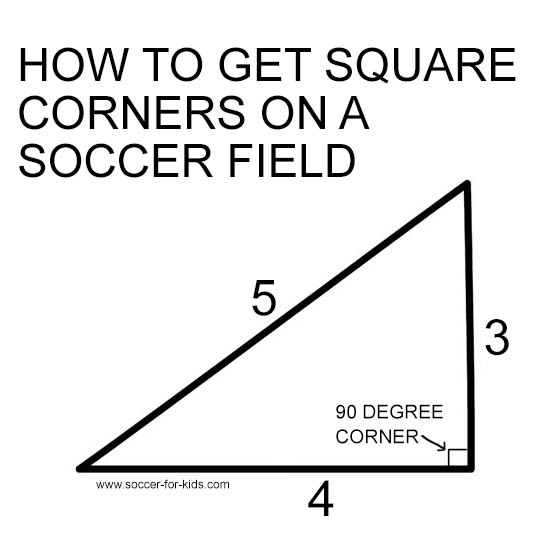 No matter what the size of the youth soccer field, you need to have a way to form a rectangle with all of the corners at 90 degree angles. That's how you make sure your field is a perfect rectangle and not a trapezoid or any other irregular shape. Whether it's just a small temporary field for a few practices you' re going to run, or a larger field for games. One you get the first corner set to a perfect 90 degrees, you can set the next corner at the proper distance for the size field you are laying out. There's a simple trick you can use that employs a basic rule of geometry. It's based on a 3-4-5 triangle, also described as a 6-8-10 triangle. They're really the same thing. Cut three separate pieces of string or twine whose lengths are multiples of 3,4, and 5, such as 30, 40, and 50 foot lengths (or 90, 120, and 150). You can go longer for bigger fields, but right now we must get the corner angles right first. Stake down the shortest (30 ft.) line at both ends where the end of your soccer field will be. Attach the longest string to the stake at one end of that line and the medium length (40 ft) to the other stake at the other end of that line. Grab the free ends of the those two strings, hold them together, and move away from the short staked line until they are equally taught. You now have a perfect 90 degree line in the corner of the short and medium strings. The dimension of soccer fields for U5 players seems to come up as a frequently asked question. The dimensions that the US Youth Soccer Association recommends are the same as for U6 players, with two exceptions, as you can see and read below. 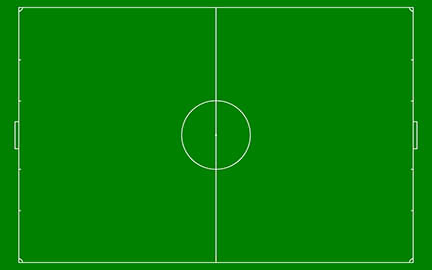 "Law 1 – The Field of Play: Dimensions: The field of play must be rectangular. The length of the touchline must be greater than the length of the goal line. Length: minimum 20 yards maximum 30 yards Width: minimum 15 yards maximum 25 yards Field Markings: Distinctive lines not more than (5) inches wide. The field of play is divided into two halves by a halfway line. The center mark is indicated at the midpoint of the halfway line. A circle with a radius of four (4) yards is marked around it. The Goal Area: None. The Penalty Area: None." A MLS (Major League Soccer) field is 150 feet in width and 350 feet in width. The goal areas are 50 feet wide and 75 feet wide. The circle in the middle of the field has a 25 foot diameter.